Going gluten free? Educate yourself about the facts! It’s Gluten-Free, Why Does It Still Make Me Feel So Bad? I was on the way back to the organic produce section of my local Safeway only to have my route impeded by a big, flashy display of assorted gluten-free products made by a company called “All But Gluten”. “Rekindle your love of baked goods” TM the trademarked slogan read. I don’t think it was by accident that this rack of goodies was right on the path to the healthiest section of the store. Not so fast! Even the most casual label reader would be able to see that these products are far from a health food. The lists of ingredients include sugar, brown sugar, and canola and soybean oils. By far the most disturbing ingredient I found was high fructose corn syrup. 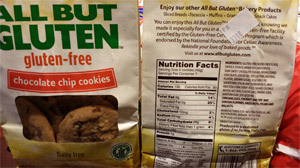 In reality these products are gluten-free yet highly proceeded junk foods. Let’s say for a minute, you are avoiding gluten, but are willing to occasionally “treat” yourself to a gluten-free food. What could be wrong with grabbing a snack from this display? Plenty, if you understand how the immune system works. The answer lies in the fact that there are many foods that look like gluten to our immune system and body. For whatever reason you have personally decided to avoid gluten, it is possible that the gluten “look-a-likes” are going to cause you the same health problems that gluten products have caused you. Some of the “All But Gluten” ingredients that mimic gluten are rice flour, tapioca flour, cornstarch, milk proteins and yeast. It is possible that when you substitute gluten-free products you may not feel any better because your system is still reacting to a whole host of “gluten-like” foods. Be aware, this is not a problem unique to the “All But Gluten” brand. 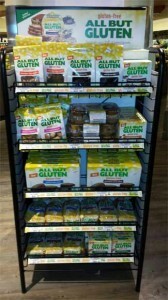 Many gluten-free products include cross-reactive foods and this includes brands sold exclusively at health food stores. Always read the label carefully! So you may be wondering how to find out if you are reactive to the foods that look like gluten to the body. You may have some limited success by being aware of what foods are gluten “look-a-likes” and keeping a food diary. The problem with this is that these cross-reactive foods can take hours and even day to cause a noticeable reaction in the body. In addition, an immune system reaction may be virtually silent and may take years to manifest as an illness. The only real solution lies in having a state of the art gluten cross-reactive foods blood test done. Cyrex Laboratories provide this type of testing as well an extensive test for gluten sensitivity. I run these tests routinely in my office when I am working with patients that have health issues that I feel may have a dietary basis. Hi Karen, Informative article. Nicely written I thought. Editing comments you requested...an s left off of food ( last sentence) and day (under gluten look a likes). Having been an allergy sufferer all my life I can really relate to what you are saying about cross reactive foods. I need to reread the article to see if the average reader who may not be as aware of food intolerances will immediately grasp the concept without more explanation.